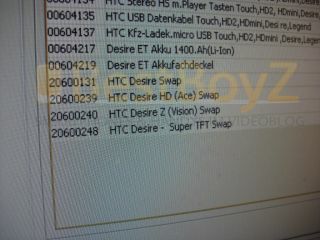 HTC Desire HD and Desire Z coming soon? Update: read our Hands on: HTC Desire Z review. HTC looks likely to be announcing two new handsets in the near future, with the Desire HD and Desire Z showing up on inventory lists. The two new phones have surfaced on Vodafone Germany's inventory lists, with the Desire HD and the Desire Z being rebadged from the Ace and Vision codenames respectively. The new phones would be different to the Desire, with the Desire HD mimicking the HTC Evo with a 4.3-inch screen and 720p video recording. The HTC Vision looks set to pack a QWERTY keyboard, and would therefore be HTC's first own-branded Android with a slide out set of buttons - something we've been seeing rumoured for ages. Of course, it will be interested how the Desire HD will be positioned given that the Desire can now record 720p video with the Android 2.2 Froyo, but a massive screen is always welcome. We're waiting to hear word on whether these phones will be making their way to the UK, but given Britain is a key market for HTC we'd imagine they would be.